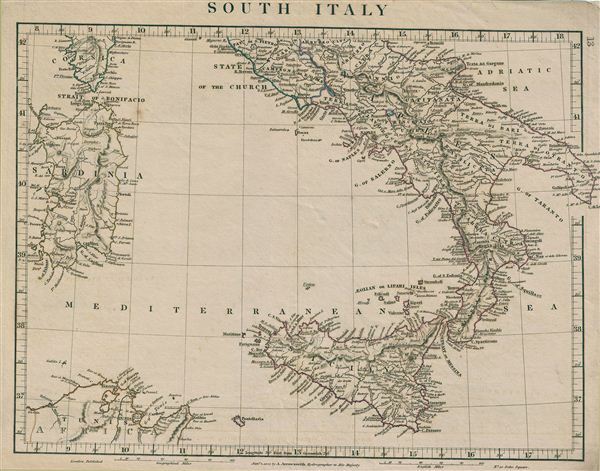 This is a rare example of Aaron Arrowsmith's 1828 map of Southern Italy. The map covers the Kingdom of Naples (a common reference for the 'Kingdom of the Two Sicilies'), which extended from the Papal States south to include all of Sicily. It also shows the islands of Sardinia and Corsica, and parts of Tunis in Africa. The Kingdom of Naples was the richest and largest Italian state before the Italian unification. During this time in history, following the defeat of Napoleon and the merging of Sicily and Naples into the Two Sicilies, the Island of Sicily witnessed revolts against the Bourbon rule in 1820 and 1848. The final revolution in 1848 resulted in the island gaining independence from Bourbon control for 16 months. The regional boundaries are colored and relief shown by hachures. This map was published by A. Arrowsmith, hydrographer to His Majesty, in 1828.